Girl Charlee Exclusive and very hard to find fabric! 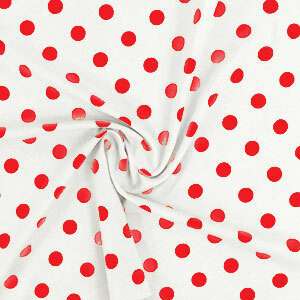 Super soft double brushed texture spun poly spandex blend knit in a natural white, not optic bright white, background color with red polka dot. Fabric has a super soft brushed top side and bottom, with a nice drape and a 4 way stretch. 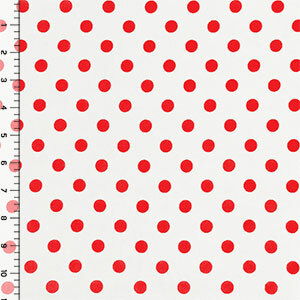 Dots measure just under 1/2". This is the popular double brushed poly spandex fabric used by designers for perfect fit and comfort leggings, workout wear, tunics, skirts, dresses, and more!